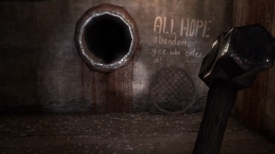 "A tense and terrifying horror game set in a maze of tunnels"
Lost in Vivo demo is a truly terrifying experience where you find yourself exploring some sewer tunnels as you search for your trusty dog, although the game is mostly going through a series of tunnels the music adds to a truly tense atmosphere, you can tell at certain points it is at an early stage in its development, the character models could use a lot of work. But as with many horror genre games and films the fear comes from the unknown and as you make your way through those dark tunnels which will lead to some pretty creepy areas, could someone be living down here in the sewers? The tense sound effects and atmosphere add to make the game overall a pretty scary experience and a cool little feature is being able to whistle for your dog although at times I found this more confusing as to wear the dog was and because the sewer tunnels are very dark did wonder if I was doubling back on myself a lot but the game is quite well designed to stop you from doing that, at least too often anyway. There is a lot that could be improved about Lost in Vivo however there is also a lot to like about it, especially if you are horror game fan. You can download Lost in Vivo demo here for free.